1913 Japanese painter Toko SHINODA was born in Dalian in the state of Manchukuo (northeastern China). 1954 Work displayed at exhibition of Japanese contemporary calligraphy, Museum of Modern Art, New York. 1956 Solo exhibition at Yoseido Gallery, Tokyo. Left for United States; stayed in Boston for a month before she settled in New York. Solo exhibition, Swetzoff Gallery, Boston. 1957 Solo exhibition, Bertha Schaefer Gallery, New York. Solo exhibition, Taft Museum, Cincinnati. Solo exhibition, the Art Institute of Chicago. Solo exhibition, Galerie La Hune, Paris; Alechinski’s film “Calligraphie japonaise” shown at the exhibition. 1958 Solo exhibition, Jefferson Place Gallery, Washington D.C.
1961 Work displayed at 6th São Paulo Biennale. Won the special commendation at Pittsburg international exhibition of contemporary painting and sculpture, Carnegie Institute. 1965 Solo exhibition, Betty Parsons Gallery, New York (also held in 1968, 1971, and 1977). Produced relief, Evolution, and mural painting, Encounter, for 2nd-floor lobby of Kyoto International Conference Hall (designed by Sachio Otani), Kyoto. 1970 Moved to live in Minami Aoyama, Minato-ku, Tokyo (to the present day). 1973 Work displayed at “Development of Postwar Japanese Art: Abstract and Non-figurative,” National Museum of Modern Art, Tokyo. 1974 Produced mural painting for lobby of main hall, fusuma-e painting for exercise hall, and stainless etching for inside wall of elevator at Zojoji temple, Tokyo (Shinoda produced another fusuma-e for the temple in 1991) . 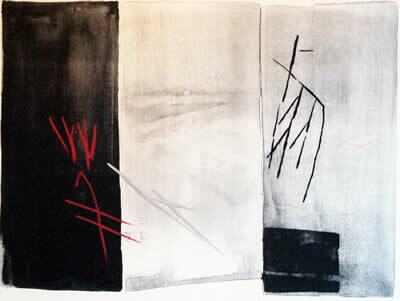 1977 Produced mural painting for official residence of Japanese ambassador (designed by Isoya Yoshida) in Washington D.C.
1979 Work displayed at “Okada, Shinoda, and Tsutaka: Three Pioneers of Abstract Painting in 20th Century Japan,” Phillips Collection, Washington D.C. (exhibition tours United States). Won the 27th Japan Essayist Club Award for her essay collection Sumi iro (The Color of Sumi). 1983 “Ogura 100 Waka Poems: Calligraphy by Toko Shinoda and Painting by Tadashi Moriya,” held at gallery of Mitsukoshi department store in Nihonbashi, Tokyo (exhibition later tours around Japan). 1989 Solo exhibition, Yurakucho Art Forum, Tokyo. 1992 Work displayed at “Callligraphy and Painting, the Passionate Age 1945-1969,” O Art Museum, Shinagawa Culture Foundation, Tokyo. “Toko Shinoda Retrospective,” Museum of Fine Arts, Gifu. 1993 Produced painting for dining hall, Imperial Palace, Tokyo. 1994 Work displayed at “Japanese Art after 1945: Scream against the Sky” held at Yokohama Museum of Art, Guggenheim Museum, and San Francisco Museum of Modern Art. 1995 Work displayed at “Japanese Culture: The Fifty Postwar Years,” held at Meguro Museum of Art (Tokyo), Hyogo Prefectural Museum of Art (Kobe), Hiroshima City Museum of Contemporary Art (Hiroshima), and Fukuoka Prefectural Museum of Art (Fukuoka). 1996 Solo exhibition, “Toko Shinoda Visual Poetry,” Singapore Art Museum, Singapore. 1997 Solo exhibition, Gallery Kohodo, Gifu (also held in 1999, 2002, 2004(twice), 2006). 1998 Solo exhibition, Annely Juda Gallery, London. NHK BS aired “Special” program on “Abstract Painter Toko Shinoda”. 1999 NHK General aired program on “Form of the Heart Depicted in Sumi” about Shinoda. Produced logo for Tokyo Bunka Kaikan, Tokyo. 2000 Published her esseay collection “Toko watastoiuhitori” from Sekai Bunka Sha. 2002 Published “Toko ehon” (Toko Picture Book) from Sekai Bunka Sha. 2003 Solo exhibition, “Toko Shinoda: Variations of Vermillion,” Hara Museum of Contemporary Art, Tokyo (visited by Her Majesty Empress Michiko). Shinoda Toko Art Space of Seki opened (opening ceremony attended by HIH Princess Hisako Takamado; exhibition of Shinoda works takes place several times a year from then on). 2010 “Toko Shinoda:Her History” Toko Shinoda Art Space of Seki (visited by His Majesty the Emperor Akihito and Her Majesty the Empress Michiko). 2012 “Toko Shinoda Art Exhibition, Letter & Form” held at Mitsukoshi department stores in Nihonbashi(Tokyo),Sendai,Hiroshima,and Matsuyama. Solo exhibition gallery of Mitsukoshi department store in Ginza, Tokyo (visited by Her Majesty Empress Michiko). 2013 “Toko Shinoda Retrospective, Momo no Fu” Gifu Collection of Modern Arts, Toko Shinoda Art Space of Seki, Museum of Fine Arts,Gifu, Gallery Kohodo. Solo exhibition, “Toko Shinoda A Lifetime of Accomplishment”, Musée Tomo,Tokyo. If you have any questions, please fill out the following inquiry form. Japanese Painting Gallery is an online art gallery dedicated to Japanese painting, Kakejiku, Ukiyoe, and so on. You can always find quality artworks and service. Payment can be made via PayPal using your credit card. Please log in your PayPal account and check out. 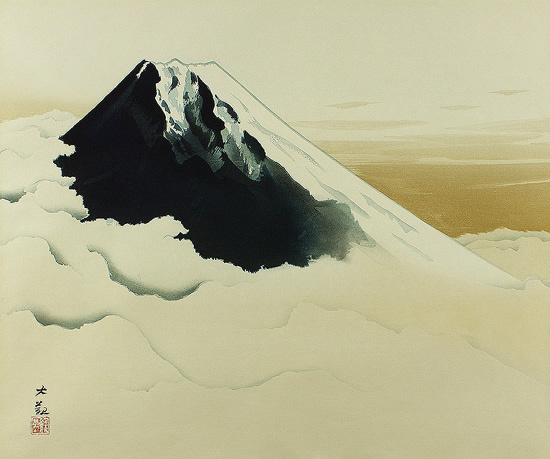 Japanese Painting Gallery stocks thousands of magnificent artworks to satisfy all of your needs. 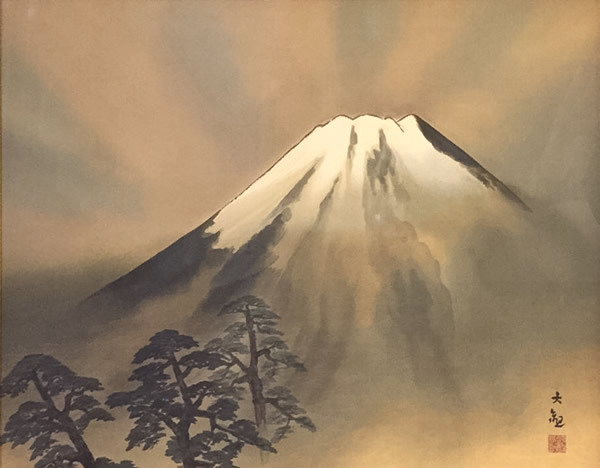 Japanese Painting Gallery sells your artworks to all over the world. Copyright 2006-2015 Japanese Painting Gallery All Rights Reserved.